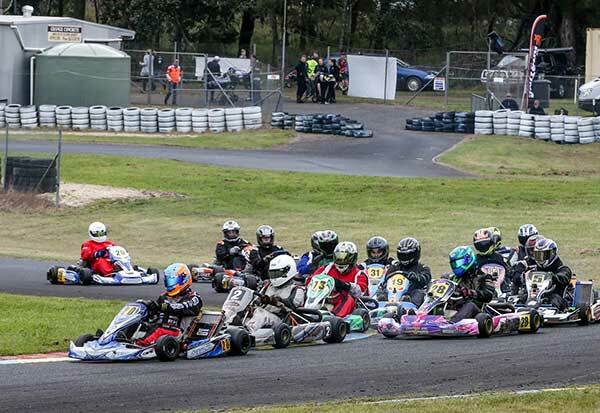 The first Spring round of the 2018 DPE Victorian Country Series welcomed 196 karters to the undulating Hamilton circuit. 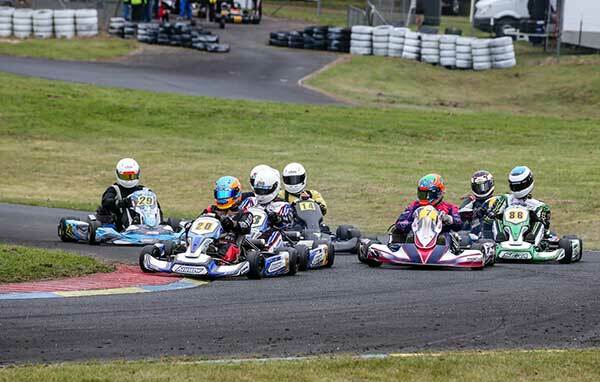 Series organisers were delighted with another strong turnout, which takes the series total to over 1100 entrants for the season, involving 341 different karters. As a token of appreciation, organisers gave away a complete set of VCS merch to the 1000th entry, and the lucky entrant was Koby O’Shannassy. 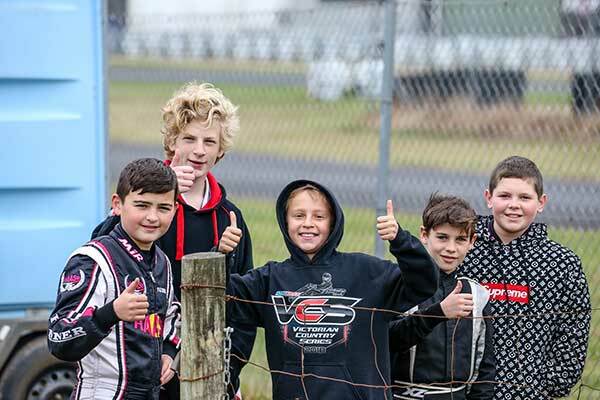 The weather was pleasantly mild, and the action was hot as karters battled hard in the penultimate round of the season. With regular commentator Michael Yeo unable to make the event at the 11th hour, local club member Andrew Hayes found himself promoted from grid marshall to commentary at the last minute, and did a stellar job of calling the action at such short notice. Jenkin got the day underway in heat 1 with a comfortable victory from Andrew Harvey. The rest of the pack was further down the road, and Marty Golledge (#11) would just take 3rd by 2 tenths over Peter Rogers (#56). Heat 2 was a closer affair, but Jenkin would still prevail out front. 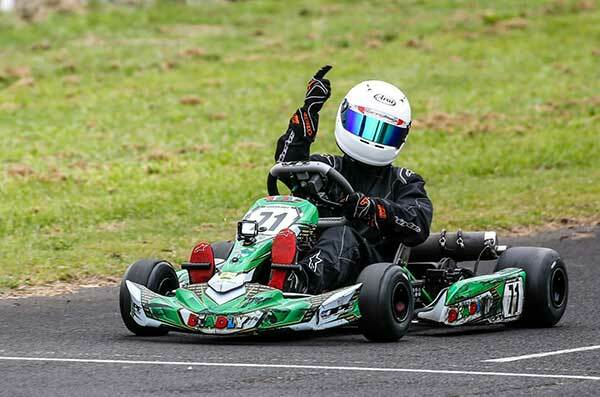 Harvey would follow him home just 3 tenths behind, followed by fresh air before the karts of Sloan and Austen crossed the line in 3rd and 4th. Jenkin didn’t miss a beat in the final, claiming the win by 1 second from Andrew Harvey. Cameron Austen would come good in the final to claim the final podium position,demoting Marty Golledge to 4th place. 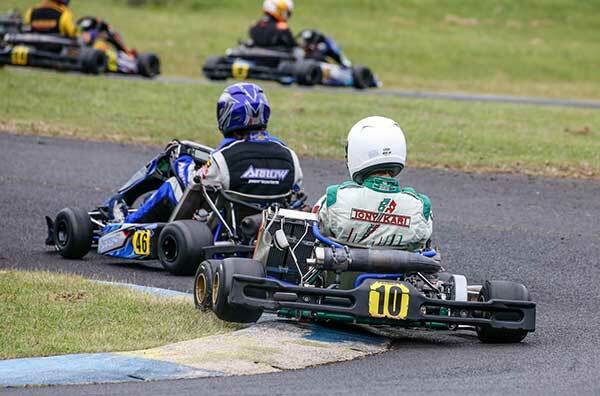 Why was karting superstar Remo Luciani (#20) running in a Restricted class? Rumours abounded in the paddock, one of them being that the master wanted to prove the IAME X30’s worth. Prove it he did, taking pole by a whopping 0.5 seconds from Ash Mitchell (#5) in second. Billy Westerveld (#2) would have been off P2, but a qualifying infringement would make him start the first heat from the hardest position. Heat 1 saw a bit of crash and bash in the opening laps, relegating Ash Mitchell and Ray Dumesny (#31) down the order from 2nd to 4th to 4th to 10th respectively. Beau Humphrey (#28) would avoid the mess to climb from 3rd to 2nd. But Billy Westerveld was the one to come out with all guns blazing, storming through the field to finish 3rd from 16th on the grid. 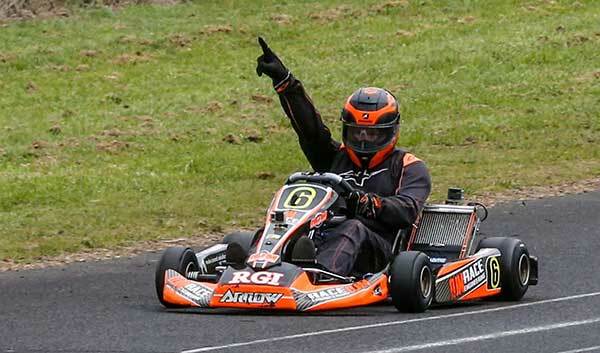 Remo meanwhile remained untroubled at the front, calmly patting the airbox and stroking the kart home for the win. From the beginning Remo was never going to lose the final, taking the win from Westerveld by 3.7 seconds. Beau Humphrey would claim 3rd position, with Ash Mitchell and Michael Angwin in 4th and 5th. An extremely close qualifying in KA4 Light saw Kobi Williams (#94), Harrison Campbell (#83), Nicholas Sacco (#80), Jobe Stewart (#30) and Bronson Boult (#71) separated by little more than 1 tenth of a second. Kobi would take the first heat from Sacco, who was in turn followed closely by Boult and Stewart, with just half a second covering the first 4 positions at the chequered flag. Harrison Campbell would drop down the order on lap 1 , followed by an unfortunate DNF 6 laps later. Jobe Stewart was shuffled down the order on lap 1, before fighting his way back to 5th at the flag. Kobi Williams and Christian Cowie (#15) had a race long battled for the lead in heat 2, exchanging positions 4 times. 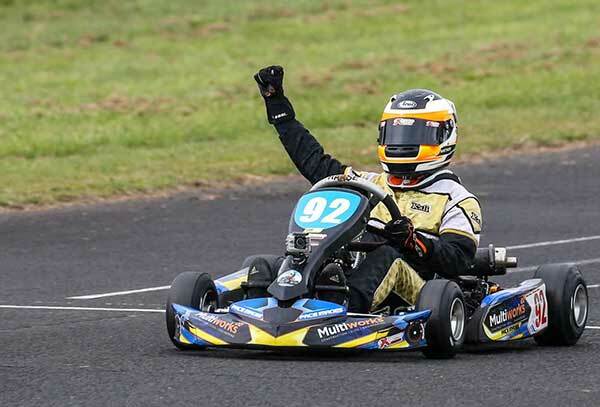 Kobi grabbed position one back on the last lap to continue his run and win by just 0.081 seconds. Sacco would be close behind in 3rd, with a short gap to Boult and Stewart. Kobi made plans to stay at the front again in the final, but his position was usurped by 3 karters just 5 laps from home. Sacco had been in the running all day, but would drop out of the race on lap 3. It was Bronson Boult that would lead the charge, moving forward from 5th on the grid to take the win in the ultra competitive class. Cowie would finish second after twice leading the race, while Jobe Stewart took care of the final podium position. Another ultra competitive class in 2018, racing to the front of KA3 Light is a tough gig. 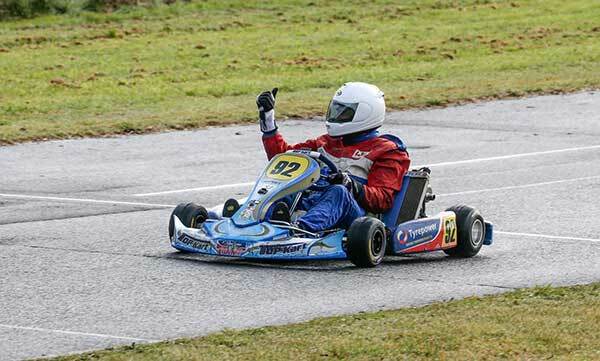 The top 12 karters on the grid qualified within 0.26 of a second, and Jack Bell stepped up to take pole. Jack Bell (#37) would take heat 1 comfortably, while Jaxson Cox (#31) maintained his second place start. Taine Venables (#43) and Nicholas Trebilock(#86) would have a good tussle for 3rd and 4th, ahead of a pack lead by Jordyn Sinni (#4). Heat 2 was once again Jack’s, but he was a little bit lucky to come out still in the lead after mowing some grass in the esses. 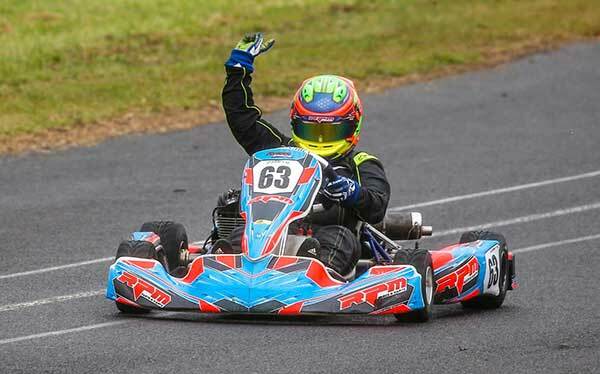 Meanwhile Taine Venables took the fight to Jaxson Cox in 2nd and Jaxson eventually triumphed for 2nd place with Taine 3rd. Trebilock would be dumped down the order on lap 1 , and suffer a DNF by lap 6. Corey Herbertson (#25) danced skilfully through the field, moving up to 5th. Jordan Synni made the biggest move, taking 4thposition from 8th on the grid. Jaxon Cox suffered on lap 1 of the final, and continued fade down the order to 5th place after starting 2nd. Corey Herbertson saved his A game for the final, and raced hard with Taine Venables to claim 2nd place from 5th on the grid. Jack Bell would claim the final by 1.2 seconds. Chris Thomas (#7) would pip Remo Luciani (#20) for pole position, but long term watchers of Remo and Chris know that Remo usually races with at least 5 aces up his sleeve. Chris lasted until lap 7 before Remo made his move, securing the win by 0.2 seconds. Aaron Jackson (#13) followed home in 3rd. The top 2 positions would remain stationary in heat 2, with Remo winning from Chris in second. Aaron Jackson would have to fend off an early charging Mitch Branson (#6) before claiming the 3rd position. Heath Jelbart (#14) would grab 4th from the back row of the grid. Chris’s pace was not as strong in the final, and we would be gapped by Aaron Jackson from the start. Jackson, in an almost identical Arrow X5 to Remo, was able to claim the fastest lap by 0.001 of a second, but could not bridge the gap to the leader. Remo would take the win by 0.8 seconds. 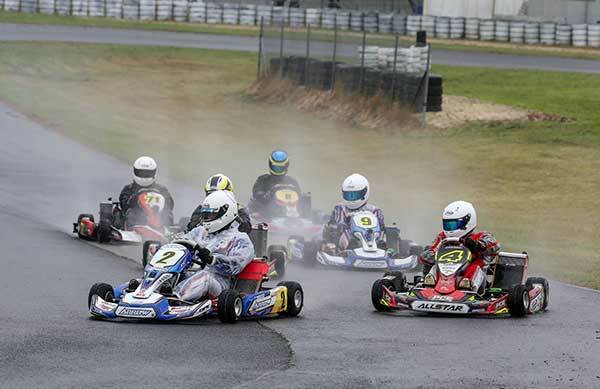 The “smallest” Cadet 12 grid of 2018 was just about a perfect fit, with 25 karts filling out the 28 kart grid nicely after fields as big as 40. Mathew Domaschenz (#92) grabbed pole by just under 1 tenth from Brocklan Parker (#7). Ryan Newborn (#72) was in the mix early, leaping to 2nd at the start, but falling down the order from lap 6 to finish 6th . Jesse Lacey (#6) moved up as high as 2nd before finishing 3rd after a battle with Brocklan Parker who would finish 2ndand claim the fastest lap. Thomas Schmidt (#36) started the day moving in the right direction, reaching 4th from 7th on the grid. Domaschenz stayed out the front, claiming the heat win by a comfortable margin. Drama on lap 3 would see Brocklan Parker fall out of contention and the field get jumbled. Schmidt would run as high as 3rd before getting passed by 2 karts 2 laps from home. Caleb Space (#4) made the most of the heat, jumping into 3rd position from 9th on the grid, closely followed by Leo Iannella (#3) who started in 11th. Jesse Lacey kept Domaschenz honest by taking the lead for 3 laps before finishing 2nd 2 tenths behind the leader. More than once Cadet 12 has been on track in their final this year when the rain hit, and it happened again at Hamilton. Dry conditions were interrupted by a light spring drizzle just 2 laps from home. Joel Johnson (#15) and Daniel Hookway (#95) were the pacesetters in qualifying claiming the first row by 2 tenths from Zaiden Barry (#63). Johnson was to get the better of the start, but would be overtaken by Hookway and Barry on lap 2. Hookway would maintain a comfortable gap for the win, with Barry in 2nd and Johnson 3rd . Samuel Davies (#10) would finish in a lonely 4th place before the rest of the pack. Johnson would get dumped down the order on lap 1 of heat 2, allowing Hookway and Barry to motor away at the front of the race. Aidan Solomon (#33) and Ben Taylor (#22) picked their way through the opening lap mess to finish 3rd and 4th, and Davies would follow them home in 5th. While sitting on the grid all drivers witnesses the rain start for the last few laps of the Cadet 12 final, and a mad rush of tyre changing took place. Hookway must have rued his fortune, as after being untouchable in the dry heats, he was overtaken by Zaiden Barry on lap 5, and Barry would pull away for a comfortable 3 second win, his first in the VCS. Samuel Davies would hold onto 3rd after having a 4 second moment in lap 8. 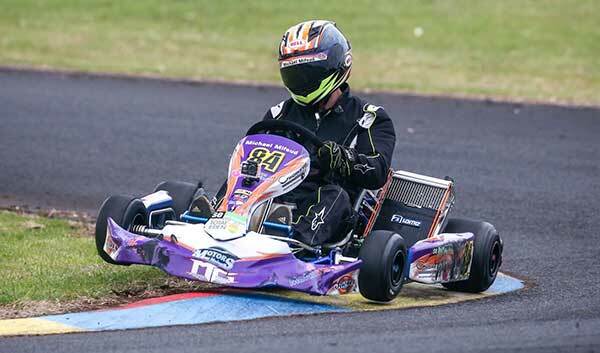 Maximus Fahey (#71) excelled in the wet conditions, finishing 4th from 19th on the grid after experiencing a run of mechanical issues in the heats. Andrew Rae (#96) would take pole position by a fraction from Jonathan McKean (#48) and Todd Chambers (#42). Jonathan McKean was the man to beat in heat 1, taking the win by 3 seconds from 3rd on the grid. Andrew Rae was chasing him in 2nd place before a DNF ended his race on lap 8. Chambers would suffer from a first lap incident that would see him relegated down the order from 3rd on the grid. Joseph Clough (#94) was the biggest mover of the final, gaining 8 places to finish 3rd. Aaron Neilson (#86) kept his nose clean to finish 2nd from 4th. Jono was out front again in heat 2, claiming the win by 1.7 seconds from Joseph Clough. Neilson’s good run in heat 1 was not to last, dropping back to 10th position by the chequered flag. Ross Stubbs (#37) was the man on the move, climbing to 3rd from 8th on the grid, and Daniel Linke would finish 4th. Starting from pole, Jono would fouled a plug in the wet final roll around, and bring an end to a very promising weekend. Aaron Neilson made his charge early, and led the lap until half distance before a retirement. Joseph Clough was in the mix all early, but would settle for 2nd in the end. Hero of the class was local P-plater Derrick Rodgers, blitzing a wet final to take the win by 4 seconds, returning to the class on P plates after some time away. Andrew Rae and Todd Chambers would follow Clough home in 3rd and 4th . McKean would salvage 8th place from the rear of the grid instead of the hard earned pole. The TAG Heavy field was looking a bit depleted at Hamilton, but the front running rivalry between the Corsa King brothers and Aaron “Arrow” Jackson continued. Aaron Jackson (#2) would claim a comfortable pole while many in the TAG field tried to conserve tyres aware that in a small class qualifying was not as important. Scott King (#4) would claim second, followed by Paul Feely (#71) in 3rd. Adam King (#3) would use those saved tyres to work his way to 3rd in heat 1, while brother Scott was out front until lap 4. Aaron Jackson would make his move for the lead, and keep the position until the end. Jackson maintained P1 in heat 2, with Scott King missing the consistency of Jackson to stay within striking distance. Adam King would finish 3rd, with a gap to the second pack of Jackson Griffith (#9), Paul Feely and Daniel Rethus (#8). The wet final saw Jackson extend his advantage, romping home to an impressive 7 second win over Scott King. On older tyres Adam King would prevail over the second pack for 3rd position. The top 5 in Tag Light were separated by just 0.067 seconds, and Harley Benson (#15) would use his home track advantage to claim the top spot. Harley would suffer misfortune on lap 1, dropping to the edge of the top 10. Jordan Rae (#9) capitalised, moving up from 3rd to P1, followed home by Nathan Williams (#95) in 2nd and Domenic Romeo (#12) in 3rd. Heat 2 would be led by Romeo, but a penalty demoted him down the order. Gerry Westerveld (#71) would become the winner from 4th on the grid, followed by Joshua Denton (#91) and Nathan Williams (#95). Jordan Rae would suffer a roll around DNF from pole position after losing a wheel. Joshua Denton and Nathan William both moved forward early, but Williams’ charge would end on lap 2 with a retirement. Domenic Romeo took advantage to move into second, while Denton held onto the lead. Connor Farr (#82) moved up from 5th to take the final podium position, while Jordan Rae had to battle to salvage 8th. Gerry Westerveld didn’t appear to enjoy the wet conditions as much as others, finishing 4thfrom the front row of the grid. Jobe Stewart (#30) took a comfortable pole from the group of Ryan Morgan (#12), Kobi Williams (#94), Jaxson Johnston (#33), and Bronson Boult (#71) were were within a tenth of each other. Stewart was even more dominant in heat 2, extending the lead to a comfortable 3.5 seconds. Kobi Williams and Ryan Morgan would have a closer battled behind for 2nd and 3rd, while Hugo Simpson would lead Bronson Boult across the line for 4th. Stewart’s stellar run was interrupted in the wet final, slipping to 3rd by lap 1, and slipping off the final podium step 5 laps from home. Boult had a taste of bad luck on lap 1, dropping to the rear of the grid from 3rd position, before making his way back to 8th. 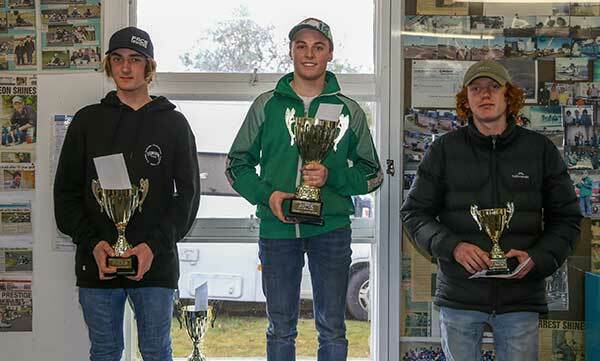 Kobi Williams secured 2nd position, but Matthew Hillyer was the one to impress, storming to the lead by lap 1 at Siberia, and taking the win by 5 seconds. The two regular front runners in Cadet 9, Rusty Ponting (#21) and Jensen Marold (#31) were separated by just 0.094 in that order for qualifying. Heat 1 was Rusty’s, claiming the win by 2.5 seconds from Jensen, while Miley Miller and Lochlan Farrell battled for 3rd and 4th. The gap was almost the same in heat 2 as Rusty took the win from Jensen. Lochlan got the better of Miley this time, taking the 3rd place. The final wowed the commentator and a impressed a lot of spectators in the paddock. Relatively new Cadet 9 Lochlan Farrell, on wet tyres for the first time ever, won the race by a whopping 18.9 seconds from the two regular front runners with sheer pace that was over 1 second per lap faster than the chasers. Rusty would lead Jensen home for 2nd and 3rd. Charlie Evans and Ewan Anderson would finish 4thand 5th. Hamilton president Matthew Crane (#97) put his kart on pole to try for a back to back win at his home track. The local boys were going to be hard to beat in heat 1, as Matthew Crane led a Hamilton 1,2,3 ahead of Ron Taylor (#92) and Andrew Stubbs (#55). The top 3 positions remained static in heat 2, while behind them Leon Forrest (#11), John Page (#18) and Ian Branson (#66) would take turns at 4th position. The last class of the day took to the greasy grid for their final and Crane was nervous that his dry heat wins might be in vane, as he was about to venture out on rather old wet tyres. His concerns were justified, as Taylor hunted Crane down using better tyres and took the lead decisively at the midway point to become master of the masters. John Page moved forward in the wet, picking off Branson and Stubbs before closing on to the bumper of Crane in the final laps. Crane would just hold on to the 2nd place, with Page 3rd 2 tenths behind. 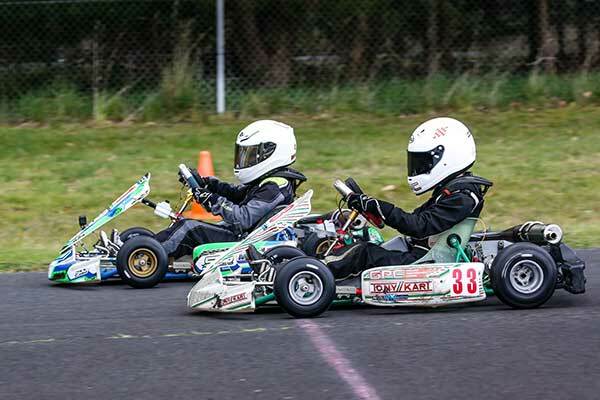 The final round is at Portland and District Karting Club on October 21 -22. The final round has an extra heat, so there are 1604 precious points up for grabs to decide the series victors. Presentations will take place at the end of racing early Sunday afternoon. Be there to be part of a huge prize giveaway, including a complete kart!